From an employer’s perspective, it is not the fact that you’ve studied abroad that makes you different or more employable. It’s how you describe what you’ve learned, how you’ve changed, and the qualities that you’ve developed and demonstrated that are crucial. 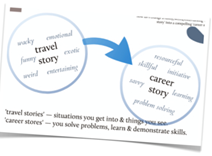 ‘Career stories’ are a way to re-frame or reorganise your ‘travel stories’ in order to use them in professional contexts. In my interview they asked me how I managed stress. I talked about when I was snowboarding in the Rockies and there was an avalanche. We needed to get out of it. We needed to stay focussed and work as a team. If you tell a story that's interesting, it makes a better impact than if you just tell the standard nine to five working story as an example of demonstrating a soft skill . So, I would bring up stories of what I'd done abroad to demonstrate how I've acted in a particular circumstance or how I've displayed a particular skill. Definitely it helps to come up with those stories! Heather has a senior role in the HR team of an accounting and business advisory firm, which operates as part of a large international network. 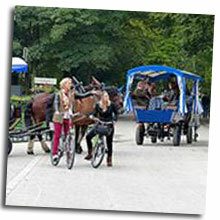 Having studied abroad as a university student herself, she sees great value in international experience. 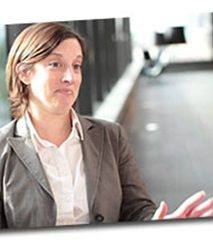 Here she explains the kinds of details that will make your stories relevant to an employer.. Your stories of drama, bizarre encounters or funny misunderstandings can often, with a bit of thought, be transformed into stories about learning, skill improvement, problem-solving, and other positive work-related traits. Try looking at the same situation using a different set of eyes … like using the lens of an employer. It can help you paint a completely different picture. I joined an intramural ice hockey team while in Canada. 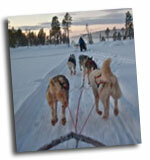 At the start I was hopeless … it was like comedy on ice. I could only stop by running into something or somebody or just falling down. In my first game I successfully saved a goal only because I couldn’t skate down the ice to go on offense with the rest of my team. Career stories are ‘back-heavy’ because they focus on the outcome. When sharing a career story you cut down on the set-up of the story and focus on the solution … that is your learning or your contribution to a successful outcome. I joined an intramural hockey team while in Canada, and I was terrible in the beginning. I stopped a goal once, more by good luck than good skating. It taught me the value of being in the right place at the right time and to make the most of every opportunity. I’m more prepared to get out of my comfort zone and take on new challenges. Employers look at more than your academic achievements – they want ‘work ready’ graduates who can show that they have specific skills and attributes. Listen to what one new graduate says about how he explained the value of his international experience to his new employer. Carl completed a Bachelor of Science in Genetics and a Bachelor of Journalism, followed by Honours in Journalism. 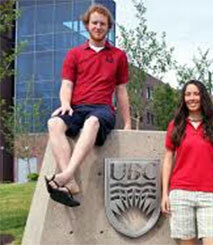 He went on exchange to the University of British Columbia, Canada for one semester. At the time, Carl was a journalism cadet and here he explains how he turned his ability to survive in a new city while on exchange into a ‘travel story’ in an interview. In the video, Greg Downey discusses the rationale behind presenting your study abroad experiences as career stories. What travel story could you re-tell as a career story? What would be the key message of your story? Use Seek.com or other employment sites to find a job that interests you. Locate the selection criteria or job requirements. Pick one criterion or requirement and think of a travel story you could re-create as a career story to help you address the requirement. Use the the un-PACK model as a guide.